This is a remarkably thorough overview of the food of Latin America. 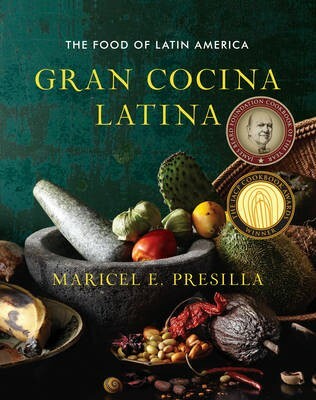 Presilla wisely skirts Mexican cuisine, which has been written about extensively in English, and devotes most of her focus to the less well-known foods of Central and South America and the Spanish-speaking Caribbean. She introduces many unusual dishes and ingredients that will be new to most readers, even experienced Latin America hands! This is very well done -- the only real omission is a list of sources for some of the harder-to-find or unusual ingredients (apparently there must some fabulous and comprehensive Latin American markets in New Jersey, where she is based, but some of us aren't so lucky). If you add the surveys of Latin American and Caribbean cooking by Elisabeth Lambert Ortiz to your collection, along with "Gran Cocina Latina," you'll have a remarkably complete reference shelf of the great dishes of a region still not well known to many cooks! I used this same adobo on both a pork picnic shoulder and chicken thighs. Both were marinated overnight. The citrus flavor was much more pronounced on the chicken. The pork, given the size of the cut, mostly just tasted of the pork. The 'brightness' of this salsa was great. Made in mortar & pestle. Pretty classic flavors. I subbed in about 1 tablespoon of fresh oregano because it's growing like crazy for me right now. A sharp and mildly spicy condiment to brighten up heavy dishes. Very simple and tasty; a must-have alongside other Peruvian recipes. Good with rice, too! I bet this would be really fabulous wrapped in a corn tortilla with some shredded spiced meat. Great little side dish that provides contrast to other heavy Guatemalan dishes. Good even on its own. Made 1/4 recipe, and that was just enough for a couple meals, used as a condiment. After a day or so, the acid mellows and the flavour of the beet juice (undetectable before) is really noticable, so may omit that optional ingredient if making ahead. Lovely colours and flavours. Will make again. I was nervous to make these because the steps in the recipe seemed fussy and deep frying new things scares me. But this was actually very simple, not too time-consuming and tasted just like the ones I've ordered and loved in the past. These took significantly longer to fry (~10 minutes) than the recipe stated. I thought this recipe was pretty solid. I agree that it seemed that the beef to chayote ratio was a little low but as someone who is not a huge meat eater I liked that. Most of the flavor does come from the Worcestershire and I think the addition of some cumin would be welcome. This is a dish that would be a great weeknight dinner except that the chayotes are a little time-consuming to cook and peel and chop. As written, I found this to be a bit bland. I think this would benefit from more beef in the mix, or less squash. Added extra worcestershire to pump up the flavours, and then the next day, some cumin and additional achiote, which helped a bit. The leftover filling found its way into a central-american style pastelito, an 'empanada' turnover of masa dough tinged orange with achiote and fried in oil as a hearty snack. It was much tastier in that incarnation. Reading the description of this dish in the book, I expected this to be pudding-y, almost like a spoonbread. But as the dough came together it seemed a bit thick (it didn't "pour" into the dish...) and the result was something more like a traditional cornbread. Not sure if it was something I did or if the description was misleading. At any rate, I really enjoyed the flavors here and would make it again. I agree with Allegra that is is an excellent and easy to make side! I subbed coconut cream for the whole milk (I had some on to use up) and it worked perfectly! In case you need to make it vegan or lactose-free, I'd definitely recommend trying it that way! Really excellent, easy-to-throw-together side. The milk thickens to a nice and creamy, slightly sweet sauce that pairs well with the beans. Reduced salt. The garlic paste, despite constant stirring, started to brown quickly so I would only cook for 30 seconds or so before tossing in the beans. Delicioso! A make-again dish for sure. So delicious. I could have eaten the whole dish. This might be one of the best things I've ever eaten. I like to judge a book by it's basics, and this one is fantastic. Well-written description for how to make long-grained rice. Must read. Great recipe- very easy to make and incredibly flavorful. Will pull this one out again. The rice has excellent depth of flavor. Oddly, the recipe has you brown the chicken, remove it to a platter, but never add it back in. I added it with the chicken stock and it cooked perfectly. I omitted olives as I don't care for them. What a fun recipe. I did serve these in shot glasses as an amuse bouche. What a hit they were. Of course, I had a lot left over, so I put them in a glass standing up. The entire recipe was eaten, and the recipe was requested. I used aleppo pepper as I like the texture of it because it is coarser than a cayenne. WAY too much salt, but otherwise delicious filling! We did not make their wrappers. I cheated and used 2 cans of black beans...added an extra sweet pepper & large onion, some dried chili pepper flakes, cut back on cumin to 1 tsp. pureed a little more than 1/2 cup of black beans. Added extra water & 1 tsp of chicken boullion to simmer. Mine turned out a little too soupy & so added an extra can of beans. Not very attractive; but Elizabeth's suggestion of cilantro/queso fresco certainly might help. However, it has an excellent taste and a creamy texture from the pureed beans. I served with diced raw, red onion & sour cream. I was pleasantly surprised and will certainly make it again. I liked this but didn't love it. It's kind of a stretch to call it a soup- more like soupy beans to be served with rice. Good flavor but think it was missing a bit of spice. Might help to have some fresh cilantro or queso fresco on top just to brighten it up a little. This is very good. Deep flavours and quite spicy. I did not add the milk nor the butternut squash. Still tasted excellent. Definitely will make again. Loved this salad. The flavour from the grilled pineapple was lifted with a bit of additional leaf - mint. I was at this authentic Mexican grocery newly opened in my town and was excited to see that they had cactus paddles. I live no where near a cactus domaine. So, I just grabbed 'em figuring I'd use EYB to find something to do with them. Here we go! The really amazing thing was I had all the other ingredients already for this recipe include the pretty obscure Peruvian peppers in the freezer! (It's a long story how they came to be there -- and they've been there AWHILE.) I liked the salad, but I just had a tough time with the cactus and it's texture. I won't throw it over. It's just my uneducated palate I'm sure. I had some leftover dressing and loved it on a more conventional mixed greens salad the next day. This was one of the first disappointing recipes in the book for me. Now, I am no expert on Cuban food, so maybe this is authentic, but I found the sauce too sweet. I did like the consistency, but it was just too sweet. I thought the lime juice in the marinade would have corrected that, but alas it did not. Next time, I think I would cut down on the ketchup. Maybe the problem was that I used canned tomato sauce. Something to think about. Still, I wouldn't repeat this recipe. My husband and son liked it, so I gave it above average. Excellent; made with cannellini beans instead of Great Northern. This is a new favorite. Such delicious flavor and very easy to put together. It tastes impressive. I just used unsweetened coconut milk from a can and thought the result was great (I may someday get around to cracking open whole coconuts...). Served it with plain steamed rice. Cooking time was exactly as directed in the recipe. Delicious recipe, will be a staple from now on as it's easy to prepare and a satisfying meal. The ingredients seemed a little odd (mustard and Worcestershire sauce) but the overall flavor was great. The chicken was good but I felt like it could've used more of the sauce. Instead of boiling it all the way down, in the future, I'd just boil it until it was thick and serve that over the chicken. As is, the sauce is very oily. A mellow pale gold, thick stew with a mild heat. Increased aji mirasol powder to up the spice quotient, but otherwise wouldn't change a thing. This was a gloriously creamy recipe, a very comforting bowl of saucy chicken presented in a new way. Loved it. Uses the Salvadorian Spice Mix recipe (relajo) on page 45. Steak is a little on the sweet side, may reduce or omit piloncillo for next time, and add some sliced white onions to the marinade. Make the Salvadorian spice mixture ahead of time and note that it makes a lot. I did like the marinade and didn't find it too sweet. I used yellow mustard instead of Dijon, that could make a difference. We did not like this cut of meat. It was very tough and unevenly cooked. I would try this marinade on a flank steak or top sirloin before giving up on the recipe. An excellent and unusual recipe! The thick-cut fries soak up all the delicious sauces in the bottom of the bowl. Bought aji amarillo in a jar, but upon realizing that the jarred peppers tasted like canned spicy green beans, decided to omit. Will look for frozen for next time. Upped the peppers(yellow, red, green) and onions and instead served an aji on the side for extra spice. I cheated a bit and bought fresh-cut fries from the local drive-in, and wouldn't hesitate to do that again! Traditionally served with rice. The extra starch side seems strange but also works well with the dish. A make-again for sure! Very good version of ropa vieja. The beef was tender and the sauce had a great flavor. It was particularly good over Cuban rice. This dish was the best thing I've cooked in a very long time. Just outstanding on a cold winter's day. My only problem was that my blender did not crush the peppercorns. I think I would just add ground pepper next time - a lot though. This is going into my favorites! We loved this dish! For us, there were too many potatoes in the dish, and I would cut those down by half. I do agree that they needed a lot longer to cook. I wouldn't reduce the size, however. I would simply put them in the pot with an hour to go. I always reduce the salt in all recipes, so my 2 teaspoons worked for us. This was an outstanding dish for a cold winter night. I made this the day before and removed most, but not all, of the fat before serving. I would not serve this with rice. Smashing the potatoes soaked up the jus. "Estupendo" is a bit of a stretch, but this was a nice-enough warming stew. I made a half-batch, which was plenty. Cooking time after adding the potatoes was twice as long as stated in the recipe, so may cut to much smaller chunks in the future. The spuds beautifully soaked up all the flavours in the sauce, and I would definitely add more of those guys for next time; they were the best part of the meal. There was a lot of liquid in the pot so I had to reduce quite a bit. Again, too much salt! Adding some additional vinegar just before serving really lifted the flavours. Truly outstanding. The meat was so tender. I was surprised at how quickly it cooked. I thought it would take a lot longer than the recipe said. Next time I will marinate it overnight instead of just 2 hours. This was really quite good. I did use the beer/vinegar substitution in the marinade. I believe this was the reason my sauce wasn't thick. It was too thin, which is why I took 1/2 a star off. Next time, I would reduce the liquid or simmer it until thickened (removing the chicken first). I will definitely make this again. This was absolutely delicious. I didn't have time to make or find chicha de jora so I just substituted it with beer and a bit of sugar. It came out fine. I will make this again. Another unusal 'criollo' recipe using native ingredients. This thickens to a very heavy, dark brown soup (for lack of a better word) full of vegetables and meat. Not something I would ever crave, but worth it just to try. Like a rustic mole. This makes a lot, and leftovers get tiresome after a while. The addition of Guatemalan Red Cabbage Relish (p150) lightened the dish considerably. Great w/rice. -Use a high sided pot when frying the spice/nut puree. It's extremely messy and dangerous otherwise. -Author recommends a blender or food processor to blend spice mix. A blender does not work. I had to add 2 extra cups water just the get it all moving. -Broiling veg/chiles/bread to blacken was faster and less messy than in a comal. This is an excellent, classic, Mexican mole. It has some kick, but is supper flavorful. I only added half the sugar, then tasted to see it needed anymore. It didn't. But I guess it depends how sweet you like your mole. A beautifully simple, perfectly light and airy sponge cake that came together very quickly with no fuss. Used to make the Miami Tres Leches out of the same book. A highly sweet and fabulous, almost juicy cake that just begs for a cup of bitterly strong coffee alongside. I didn't top with the suggested meringue (with 1 cup of corn syrup for the topping I thought that would be sugar overload) and opted instead for a (very) lightly sweetened whipped cream. For the milk mix, I used half and half in place of whipping cream. I found that there was a bit too much liquid pooling around the bottom of the cake pan and wonder if inverting it for a spell might help to evenly distribute the milk mixture. Either that, or reduce by about a quarter. A very, very rich cake that can only be eaten in small portions. Super simple and delicious nonetheless. Used with the suggested sponge cake recipe within the same book. Perfect with a side of fresh berries. This is extremely thick and extremely rich, too much so for my taste. The recipes themselves tend toward the involved and elaborate. This can be great fun -- but also confusing. Ingredients pose another challenge. ...That being said, the food produced is wonderful. Gran Cocina Latina unifies the vast culinary landscape of the Latin world, from Mexico to Argentina and all the Spanish-speaking countries of the Caribbean. In one volume it gives home cooks, armchair travelers, and curious chefs the first comprehensive collection of recipes from this region. An inquisitive historian and a successful restaurateur, Maricel E. Presilla has spent more than thirty years visiting each country personally. She’s gathered more than 500 recipes for the full range of dishes, from the foundational adobos and sofritos to empanadas and tamales to ceviches and moles to sancocho and desserts such as flan and tres leches cake. Detailed equipment notes, drink and serving suggestions, and color photographs of finished dishes are also included. This is a one-of-a-kind cookbook to be savored and read as much for the writing and information as for its introduction to heretofore unrevealed recipes.